The 4th of July is made for picnics, beer, lemonade and potato salad. That makes the 5th of July perfect for wine! Urbano Cellars is having a release party to celebrate their new wines. Join me in toasting these new releases across the bay with Urbano at Periscope Cellars (click for Google Map) in Emeryville. Afterwards, we can mosey on down to Lost Canyon and maybe even invade Rosenblum. Check out other East Bay wineries at East Bay Vintners Alliance. 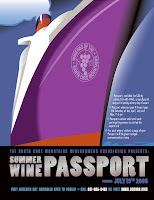 As I was reading the list for the July 19th Santa Cruz Mountain Passport, I was happy to see there are now several wineries in the San Carlos / Redwood City / Woodside area. As much as I love driving down to Santa Cruz, with the gas prices and beach traffic the way they are right now – wouldn’t it be fun to go local? PS if you want to Caltrain, you can walk to Dominico from the San Carlos station!